Byingo LED growth lights help accelerate the growth of indoor plants. Emits the wavelength of light that can be fully absorbed by plants photosynthesis, best for blooming, fruiting and promoting the leaf, can rapidly improve the health of plants.Ideal for all phases of plant growth, and works well with water solution culture and soil culture. Can be used in house garden, pot culture, garden, sowing, breeding, farm, flower exhibition, bonsai, garden, green house, sowing,breeding, farm, greenhouse cultivation, water soluble breeding, greenhouse cultivation, pipeline cultivation and so on. Tips: Could connect up to 4 tube lights together with seamless connectors or connector cords. 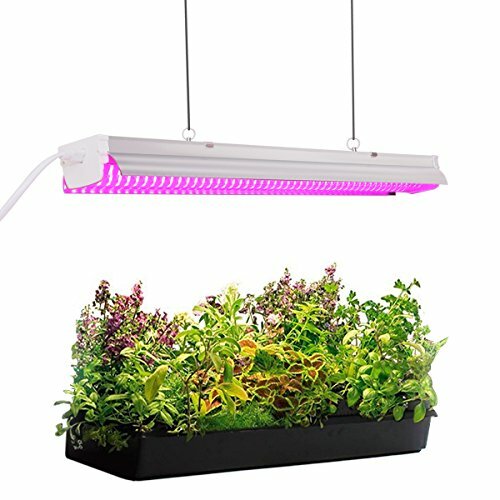 Full spectrum add lights to help plants grow, sprout and flowering, rapidly promoting leaves and flowers blooming. Help plants absorb nutrients, especially some trace elements. LED lights have low power consumption, high luminous efficiency and long service life, can save more than 65% on your electricity bill. Very easy installation, integrated fixture, comes with a 4.9ft cord with on/off switch, very convenient for your operation, totally plug and play. Extendable design, could connect up to 4 fixtures together with seamless connectors or connector cords. Ideal for house garden, pot culture, garden, sowing, breeding, farm, flower exhibition, bonsai, garden, green house, sowing, breeding, farm, greenhouse cultivation, water soluble breeding, greenhouse cultivation, pipeline cultivation and so on. If you have any questions about this product by Byingo, contact us by completing and submitting the form below. If you are looking for a specif part number, please include it with your message.